As an early adopter of almond milk – or as an early almond milk drinker – I’ve always been aware of the nutritional value of almond milk. But the reasons I bought it was because I always found the taste of cow’s milk too strong. I also lived with a relative who was lactose-intolerant; we shared some of our groceries. She and I drank a lot of soya at some point. But then reports came out suggesting that too much soya was harmful. So we switched yet again. Looking at the nutritional analysis, almond milk seemed like a good alternative. The popularity of almond milk is recent and happened fast. It has been reported that almond milk sales have beaten soya milk sales in Waitrose for the first time. I only started noticing almond milk on shelves in 2014. But the popularity of almond milk is not what’s surprising here. What’s more surprising is the fact that a Google search for ‘almond milk’ equally churns out millions of articles with controversial titles and disparaging views. These articles have titles which range from the cynical to the downright angry: ‘Almond milk is a rip-off’ and ‘Lay off the almond milk, you ignorant hipsters’. I would never have thought that a milk could cause so much distress and anger. As an almond milk drinker (Alpro, yes), I have never self-identified as a hipster. The heading does imply that everyone who drinks almond milk is 1)ignorant and 2)a hipster. I profess to being neither, yet cannot claim to not have a desire to follow food trends when they suit me. These anti-almond milk campaigners rail against the profit margins that almond milk production companies are making from sales. But any business in the world has a goal of making some sort of profit. A company that doesn’t do so cannot really call itself a viable business. The whole underlying notion behind any food business is that a profit be made from selling to consumers. Whether the product they sell is nutritionally beneficial to humans or not, is another story. 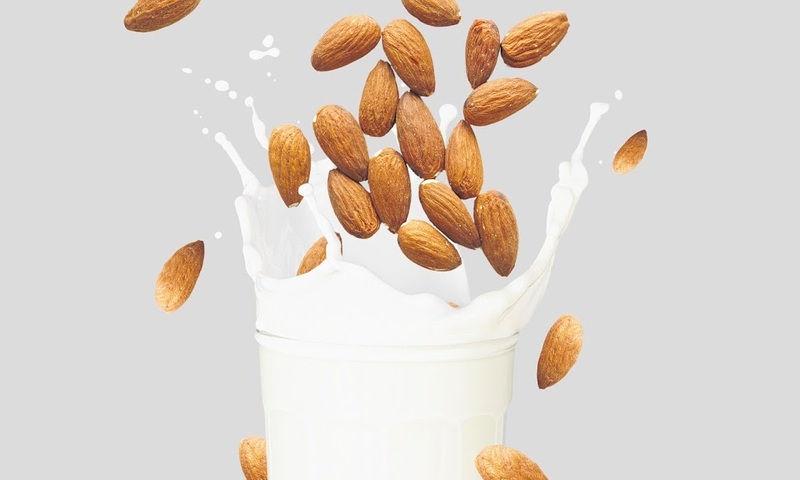 Granted, almond milk is made up mostly of water and, as the article says, does not contain as many nutrients as eating a handful of almonds would. This is an argument ‘against’ drinking almond milk that I agree with. You are paying for some expensive water – but whether that water is pure, fortified with vitamins and minerals, is the basis for a choice of Hildon over ordinary tap water, for example. The fact that almond milk contains such and such amount of minerals and nutrients is already good enough for those who simply like its taste. Any added nutrition is a plus. Critics have argued that you would need to drink a whole lot of almond milk in order to reap the benefits of the milk’s nutritional content. Sure, I get that. But there is no one-fix drink that fulfills all your nutritional needs anyway (Soylent, anybody?) From a general healthy person’s perspective, it’s all about maintaining a balanced diet anyway and people who buy almond milk – or don’t buy almond milk – should be aware of this tenet. It is also hard to produce milk from a nut without adding a lot of water. An almond is hard, dry and coarse. Even if one made almond milk and were able to use more almonds than consumer processed almond milk, it is very difficult to make something at home from scratch and then mass produce that product hoping to get the exact same characteristics or properties. The process of tweaking and fine tuning the product to match mass production standards and specifications requires skill and expertise. Even then, it is unlikely that this mass manufactured product will fulfill all the idealistic parameters that consumers want. (Coming from food manufacturing, I should know this. They want ‘value’ i.e. cheap, but also good quality – a near impossibility I would say.) What the arguments mostly show is a lack of understanding of manufacturing processes and procedures. There is a lot that goes into the manufacturing of almond milk than simply grinding the almonds and adding water. Rather than to stereotype almond milk drinkers as unthinking ‘ignorant hipsters’ and write off almond milk as as fad, it’s much better to take a more balanced view and provide better reasons for not drinking almond milk. The almond milk critics seem to have failed to address the potential risks for children who drink mostly almond milk and not cow’s milk (if there are any of these children). I think this is important for readers to know, especially if they are already considering ‘switching’ to almond milk just because they have read somewhere that it’s ‘good’. And it is quite good. But like many other manufactured foods, it’s not perfect. And that’s okay so long as we know what exactly we are taking and how much we should be taking in relation to our intake of other food sources of protein and calcium. A recent article by the Guardian has stated that almond milk, while great for the human body, has adverse effects on the environment. This news is quite startling for not only have I never given much thought about the environment in relation to almond milk. but that something so seemingly virtuous is paradoxically harmful to our ecosystem is lamentable. This would be especially conflicting if one were to have a holistic and sustainable approach to life; the belief that what we consume should never be more than what Mother Nature can handle. As an advocate for both environmental protection and personal health and wellness, I feel conflicted. And this is good. It makes me question my intake of almond milk and it does seem like we almond milk drinkers and nut eaters might have to consume less. But what is excessive and when is too much? I believe that the ideology and standpoint of the critics come not from a concern for human nature and human health, but from anti-commerciality and anti-consumerism. The backlash against almond milk, like populist propaganda and policies, is simply a way of expressing distaste for a perfectly good product just for the sake of it. It is not a defense for any underlying moral or even physiological ideology. These almond milk critics, like the people they deride for drinking almond milk, have a desire to be ‘trendsetters’ in the sense of being contrarians or non-conformists. In a way perhaps ironically, we are united. I think we also have to remember that these are not writers conducting a scientific study of almond milk and its effects on the population, but a subjective analysis of the cons of drinking almond milk. It’s an opinionated study on ‘why they think almond milk is bad’. It’s not completely factually written, even though they present their information in a factual manner. At the end of the day, there should be no hard and fast rules that govern what we eat. We should instinctively and intellectually ‘know’ what kind of food is good for our individual bodies. But I understand that sometimes it’s a lot easier said than done, which is why we need the media and experts to advise us on what we should and shouldn’t eat. My best non-expert advice however, is to always take such stories with a pinch of salt. I genuinely feel that as consumers we can trust what the manufacturers produce for us is consumable. But it is our responsibility to judge how little or much we should be taking of the product, and at the same time, to look at the big picture to see if what we are eating is good for the environment and sustainable. It is not up to the media to decide for us.